"Everyone needs a great, simple chocolate mousse recipe up their sleeve. This one is quick and easy to prepare but silky smooth and decadent. It's a soft-set mousse for pouring into and serving from glasses or dishes, so just increase the gelatine if you are planning to unmould the mousse. Remember to use the best-quality chocolate that you can afford for the best results. Violet colour and essence can be found online or in dedicated cookware and specialist food shops." ~ Darren Purchese. Place the milk and cream in a saucepan over medium–low heat and bring to a simmer. Remove from the heat. In a mixing bowl whisk the sugar and egg yolks together until they start to thicken and pale. Pour one-third of the hot milk mixture into the yolk mixture and whisk well. Pour this mixture back into the saucepan with the remaining milk and cream and mix well with a spatula or wooden spoon. Cook, stirring constantly, until the ice cream base reaches a temperature of 82°C (180°F). Remove the custard from the heat and strain it into a bowl. Set this bowl in the larger bowl of iced water to cool the custard down quickly. Stir regularly. Once cool, whisk in the violet essence and colour and churn in an ice cream machine according to the manufacturer’s instructions. Store the ice cream in the freezer until needed. Tip: You can make the ice cream base up to 4 days in advance but try to churn the ice cream on the day of serving for the best possible result. Place a couple of plastic containers in the freezer. 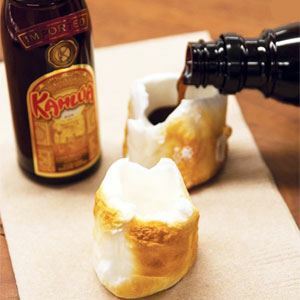 Mix the chocolate and cocoa butter together and pour into a warmed 1 litre (34 fl oz/4 cup) siphon gun. Screw the lid on tightly and charge with three whipped cream chargers ensuring to vigorously shake the gun in between each charge. Discharge the mixture evenly into each container in the freezer and shut the door to let them both set hard. After 1 hour remove them from the freezer and cut into pieces using a sharp knife. Store the aero pieces in a sealed container in the refrigerator. Put 80 ml (2 1/2 fl oz/ 1/3 cup) of the cream, the milk, sugar and vanilla seeds in a saucepan over medium–low heat and bring to the boil. Whisk the remaining cream to soft peaks. Pour one-third of the cream mixture into the egg yolks in a bowl and whisk together well. Pour this back into the pan with the cream and milk and mix well with a spatula or wooden spoon. Cook, stirring constantly, until the temperature of the custard reaches 82°C (180°F). Strain the custard through a sieve into the chocolate and add the soaked gelatine. Whisk together well to dissolve the gelatine and form a smooth and shiny chocolate cream. 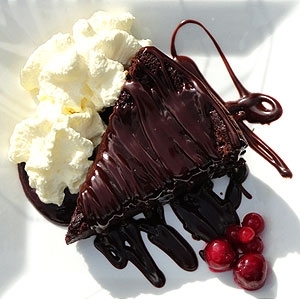 Use a spatula to gently fold one-third of the chocolate cream into the whipped cream and incorporate it well. Then transfer all of this mixture back into the bowl with the remaining chocolate cream. Mix well to obtain a smooth chocolate mousse mixture. Place the mousse in a container and chill in the refrigerator for a minimum of 1 hour. Place some mousse on a serving plate and dust with some cocoa powder. 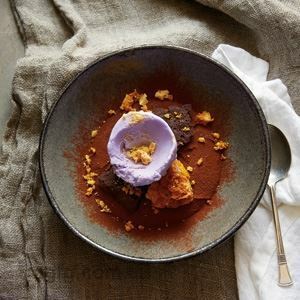 Sprinkle some small pieces of honeycomb around the plate and top with the violet ice cream and aero. 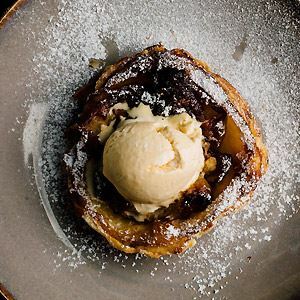 Credits: This is an edited extract from Lamingtons & Lemon Tart by Darren Purchese published by Hardie Grant RRP $49.99 available in stores nationally. 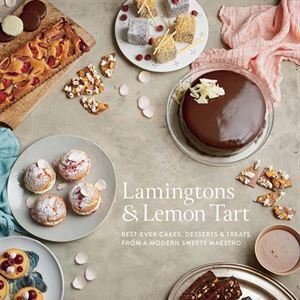 Photo Credits: This is an edited extract from Lamingtons & Lemon Tart by Darren Purchese published by Hardie Grant RRP $49.99 available in stores nationally.